We have a guest post by a reader named Josh. 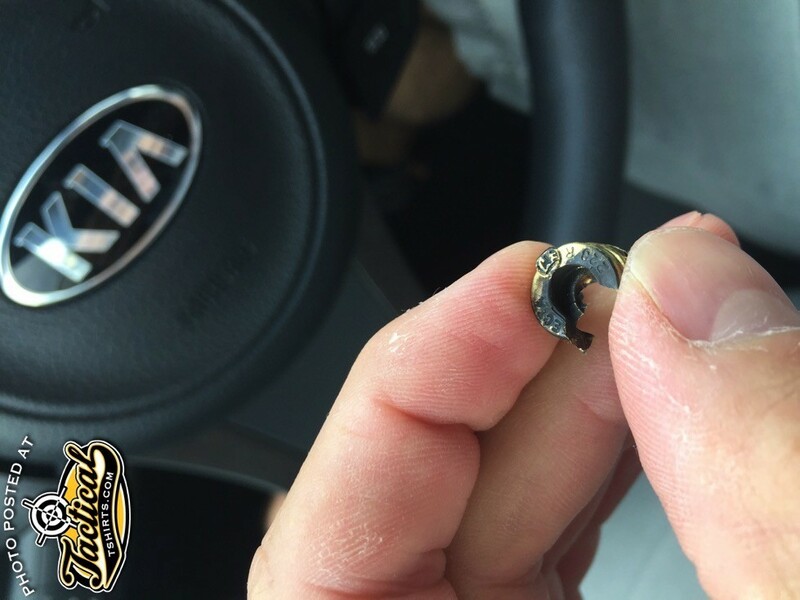 He shares with us his story about a catastrophic AR kaboom he had this year. It’s interesting to read how it all played out. But I also wish to add a datapoint of my own. Earlier this year, our local SWAT team had a Kaboom with factory ammo (Fiocchi) that resulted in the officer being temporarily disabled and his rifle destroyed. Upon inspection of his rifle and ammo, it was determined that the factory ammunition being used WAS NOT properly sized for the round. Thus leading to the rounds being able to be setback in the the cases. 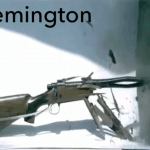 As for WHY this officer’s rifle kaboomed specifically that was never determined. Setback? Wrong powder? Powder leakage? Sympathetic detonation? All possible. Fiocchi replaced the officer’s rifle at their cost.—Marky, editor. 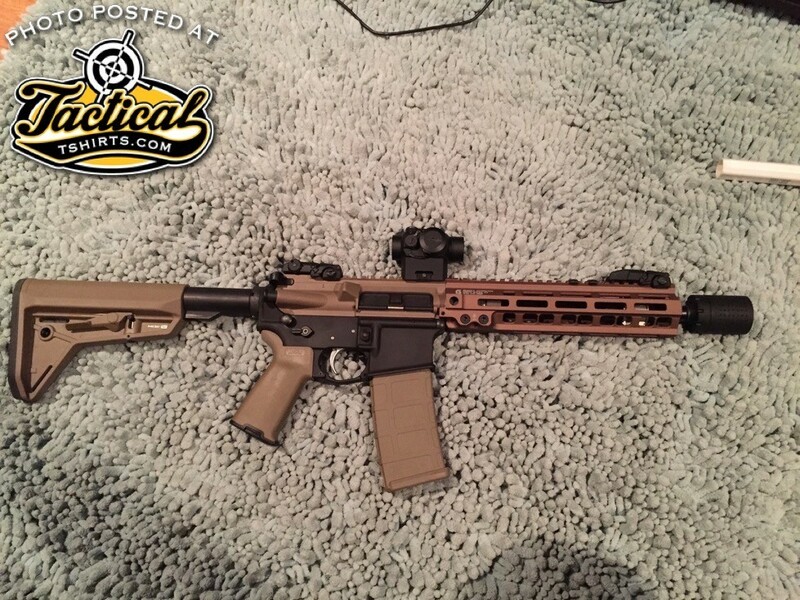 Earlier this year I had a catastrophic failure with a custom built AR-15 I assembled myself. Sorry it’s a bit long winded but I wanted to share this story as completely and honestly as possible in case it benefited any other shooters. The pictures will likely scare the crap out of even seasoned AR shooters. 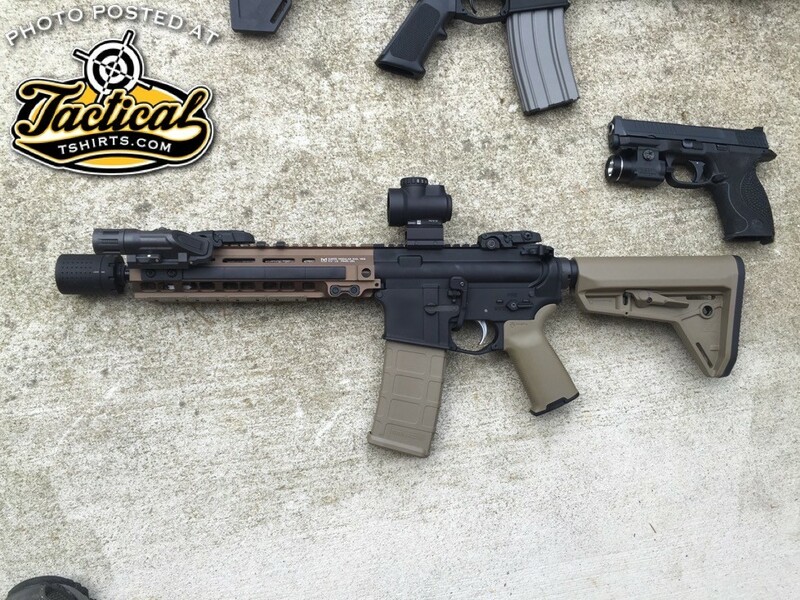 On 29 July 2016 I took two of my ARs to my local range to zero optics and break in a new upper i had just built. I brought several mags of Tula .223 and two mags of Walmart brand Perfect .223 that had been loaded for several months and sitting in my safe. I ran all of the Tula through my 16” M&P-15 confirming zero and running drills. I then moved on to the magazine with Perfecta and shot about 25 rounds through the M&P-15 and decided to put that gun away. I then put up a fresh target and prepared my new 10.5” upper on SBR lower with the intention of breaking in the barrel and zeroing my vortex red dot. I loaded the same magazine i was previously using with only 3-5 rounds of Perfecta left in it and chambered the first round. First shot fired with no issues and i saw that the round was left of POA. I reset the trigger and fired again and KABOOM – catastrophic failure. 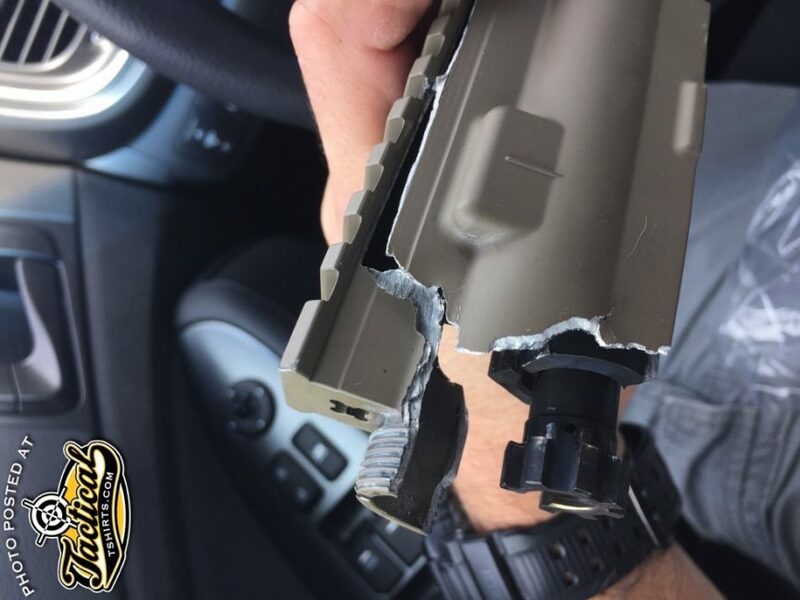 The upper receiver was cracked open and the mag was shattered everywhere. The bolt was stuck forward and wouldn’t budge. After my initial shock and mandatory body check I noted that i had a small gash and powder burns on my support arm. – an undamaged and almost perfect looking 55gr projectile was sitting on the bench beside me, no case or powder were observed. 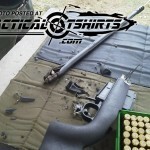 – a complete .223 round was also on the bench beside me, although the case was heavily crushed and deformed. – the upper receiver was destroyed, and the bolt was also clearly destroyed. the pmag was obliterated and pieces were everywhere. 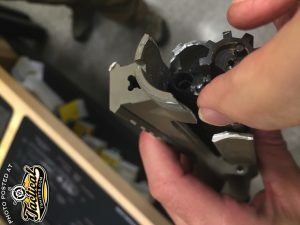 The range employees at Elite Shooting Sports (Manassas VA) were friendly and helpful, but couldn’t clear the weapon on the line, so they took the rifle and we went back to the armorers bench to work on it. 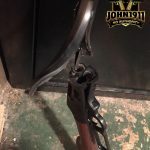 Getting the bolt out of the barrel extension pretty much took an act of god, as the bolt lugs didn’t want to come out of the barrel extension and eventually only came out with a lot of blunt force. 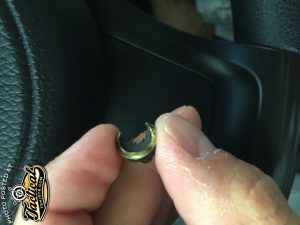 The brass casing from the round that exploded was stuck in the chamber and could not be coaxed out. 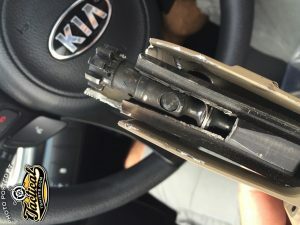 The case head separated at the neck and you could see the perfecta stamp, the .223 stamp and also the compression from the ejector which must have hit with considerable force. 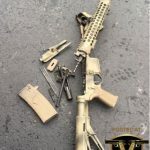 The lower receiver assembly (except the bolt catch) and Geissele rail were undamaged, but the upper receiver, bolt, carrier, charging handle and barrel extension were destroyed and the vortex sparc and its mount were damaged. At this point i took most of the pictures you see here. I saved all the pieces and took some photos. After talking to my people the two obvious questions were “did you put .300 BLK through the barrel?” and “did you check the headspace?”. The answers were “No” and “No”. The possibility that the headspace was out of spec cannot be ruled out at this point. 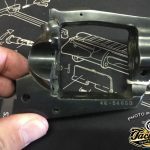 However, i was using a BCG and barrel from Rev Arms out of Danville VA and I have more faith in their QC than I do for Perfecta ammo, as they make quality guns (not budget) and parts for competition and their reputation while relatively new, is good. 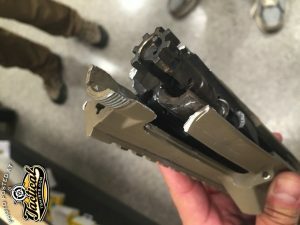 I had also previously used the same BCG in a different Rev Arms factory upper with no issues, and since the first round did fire successfully i think a headspace issue is much less likely than an ammo issue. (Note: i have since rebuilt my 10.5” upper with Rev Arms barrel and it is both in spec, and shoots great). 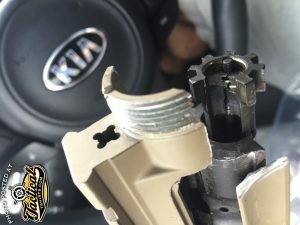 After doing some searching online i found the following article on soldiersystems.net about a duty rifle in the northeastern states that had a catastrophic failure, and the pictures mirrored my own remarkably close, the damage to the bolt, extractor, carrier, upper receiver, and right down to the damage to the separated case head all looked identical to what happened to my rifle. Open the PDF for all the pictures. I contacted the author of the article and he was happy to chat. 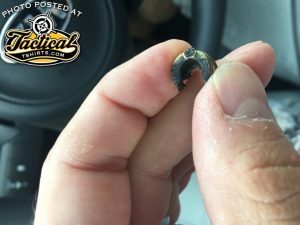 His research ultimately pointed to a bad round causing the failure in that rifle, and he told me that the only way to replicate that kind of pressure in a .223/5.56 chamber was if two 55gr projectiles were loaded into a single case somehow. 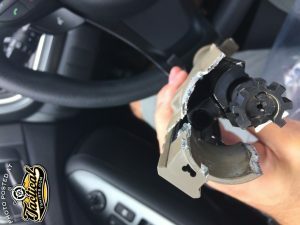 He said anything bigger than 55 gr wouldn’t fit, but if two 55 gr projectiles somehow made their way into a single case, it could cause that kind of pressure in the chamber and result in the catastrophic failure seen in his pictures. Don’t ask me how two bullets can end up in the same case, I’m just relaying the story. At this point my honest impression was that I had horrible luck and a bad round was the cause of my rifle exploding in my face. So with no real expectations of any action on their part, i contacted the customer service office at TulaUSA (Perfecta is made by Fiocchi in Italy, but is imported by Tula so FiocchiUSA has nothing to do with it strangely) and left a message. I was contacted a few days later by the customer service representative who was very friendly and apologetic that i had a bad experience. He simply asked that i send any pictures i had and an explanation of what happened to his email address and promised to investigate. At that point i was surprised by how apparently willing he was to lean towards accepting responsibility for my rifle exploding. About two weeks went by and Adam contacted me again apologizing for the delay, but that he had a death in the family that kept him out of the office. He finished by simply telling me to send him the cost of replacing my rifle, and they would take care of it. That was it. I thanked him, gave consolations for his family loss and told him i would tally the cost to replace my rifle. I simply tallied the exact cost of the parts that were destroyed and passed him that total, $556 along with links to the exact parts for sale online for integrity. I really appreciated the level of customer service and care i received, i was legitimately shocked to be honest since i was not expecting a large company to react that way. I suppose that in cases like this the potential for litigious customers to cost the company a lot of money is high, so they would rather take care of people immediately for relatively small sums. Either way i clearly got lucky in more ways than one. I received a check in the mail from TulaUSA for $556 a few days later. Rifle after after new upper installed / replaced. – To always confirm headspace with custom rifle builds. Its a shame that my new upper exploded, but in the end I’m glad i didn’t get hurt. I ended up replacing the broken parts at the Dulles Gun show the same weekend that my rifle exploded. Rev Arms was kind enough to give me a discount on a replacement barrel and I just bought the other parts out of pocket because i was impatient. After assembling another new 10.5” upper and checking the chamber specs, i took it to the range and put about 10 rounds through it. The first few rounds I had to shoot from behind the gun, with my support hand on the buttstock and the rail on a rest. I was too scared to be anywhere near it when it fired, I was legitimately shook from the experience. So after firing a few rounds slowly, with only a single round in the magazine, and ensuring the gun was in battery and chambering rounds properly i got more comfortable and fired a few more rounds holding it properly. I had to get back on the horse right away. Oh yeah, Vortex sent me a brand new Gen 2 Sparc and new mount for free no questions asked of course.